Many thanks to everyone who supported the Easter egg raffle in aid of the Towns Christmas Lights. This is the first of the fundraising initiatives this year, a total of £60.50 was raised. 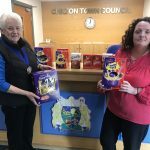 Please claim your prize (easter egg) from the Town Council offices (Hutton House, Durham Road, Chilton, Co. Durham DL17 0HE). Please can you bring your ticket with you to claim your prize. Further fund raising is planned, if anyone has any prizes they wish to donate please drop them off at the Town Council offices. Any donations will be greatly received. Any queries telephone 01388 721788. The Deputy Mayor, Councillor E. Bruce raised the dedicated St Georges flag to remember England’s patron saint. Members would be grateful if residents would kindly complete the attached event & leisure provision consultation and return to the Town Council office asap. Residents views/suggestions are an essential in ensuring the Council meet the aspirations of residents. On Saturday 30th March a public consultation was held at the Town Council office, the display can still be viewed in the Town Council offices, residents are welcome to come in and take a look and make any comments. Members would be grateful if you would kindly complete the attached Christmas Lights Display consultation and return to the Town Council office asap. Residents views/suggestions are an essential in ensuring the Council meet the aspirations of residents. 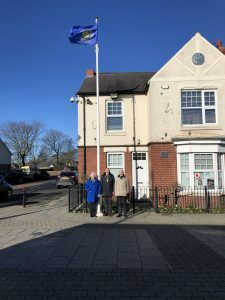 Given that Wednesday 20 March 2019 was County Durham Day the Mayor, Councillor Michael Young along with local residents of Chilton joined together to raise the County Durham official flag. 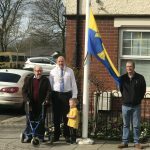 The Mayor, Councillor Michael Young asked Mr J Moffatt if he would like to raise the flag given that it was his twin daughters who won the competition to design the County Durham flag in 2013. 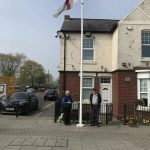 Mr Moffatt was happy to raise the flag on behalf of the residents of Chilton. The Mayor, Councillor Michael Young will raise the County Durham Flag on Wednesday 20th March 2019 outside the Council offices at 11am. Everyone welcome to attend. Rent notices for 2019 – 2020 (include water charge for 2018/2019) have been posted and are due for payment from 1st April. Please pay between 1st – 10th April (Monday – Friday between 9am – 3pm). Payment can be made by cash or cheque (payable to Chilton Town Council). Included with the notice is the tenancy agreement which needs to be returned. In addition information relating to the possible formation of an Allotment Association is included. Please read, members would be grateful if you would return the slip indicating your preference. Other points to note is that allotment inspections will be carried out w/c 20th May weather permitting. 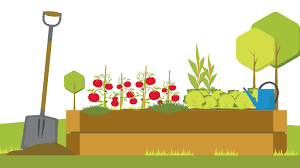 Allotment meetings are held on the third Thursday of each month at the Council offices commencing at 10.30am, tenants are welcome to attend. Allotment tenants will be kept updated on any new developments. For further information contact the Town Council. For full details including: Statement of persons nominated, notice of poll and situation of polling stations please see attached. 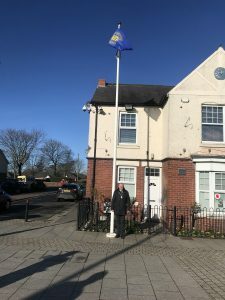 The Mayor, Councillor M. Young raised the Commonwealth flag on Monday 11th March 2019. The Mayor made reference to the Commonwealth statement from Her Majesty the Queen.